By the time that the Licensing Reduction Board ruled that the hotel was to close, Carlton & United Breweries was the owner of the two-storey bluestone building. In July 1908 the Board took evidence as to the compensation payable to owners and licensees of delicensed hotels in Collingwood. 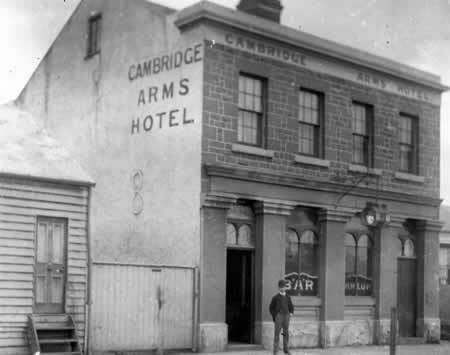 In the case of the Cambridge Arms Hotel, Cambridge Street expert evidence was called to show the value of the building with and without a licence. 'The building is old, of bluestone, but very substantial and it would cost 150 pounds to convert it to a dwelling. If a factory were built on it might return up to 7 per cent. For the licensee Mrs Margaret Thompson... it was contended that owing to her ill-health the takings had fallen very low, and did not represent the fair value of the license'.